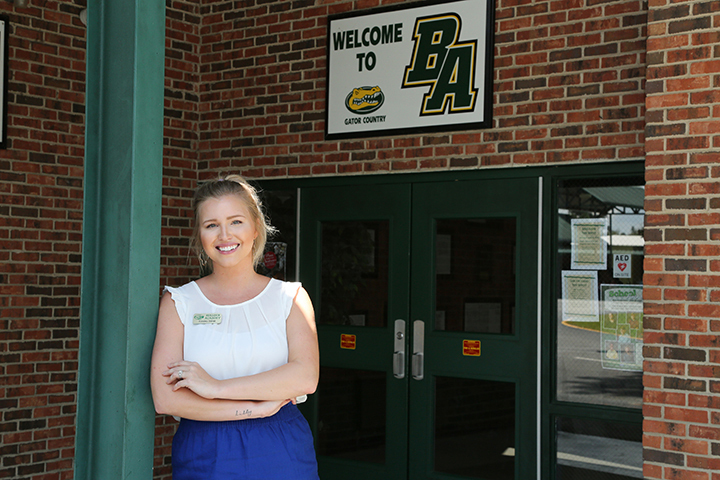 As a counselor in the Upper School at Bulloch Academy in Statesboro, Kinsley Baker has a great job and a good quality of life. The leadership program, developed by UGA’s J.W. Fanning Institute for Leadership Development for the Lynda Brannen Williamson Foundation in Statesboro, helped Baker realize she needed a change. Lynda Williamson, a civic leader in the Statesboro community, established the foundation before her death in November 2014 to help guide and mentor young women in southeast Georgia. The leadership academy focuses on servant leadership, mentoring and developing a personal leadership style. Fanning Institute faculty, led by Maritza Soto Keen and Carolina Darbisi, cover topics like personal leadership, communication and conflict, strategies for effective ­leadership, career and professional skill development and multigenerational leadership. The class also meets with local and state leaders. Program participants also work together on a community service project, which helps them bond. So far, 48 women have graduated from the program, held each year since 2015-16. The first two groups organized activities in the Statesboro area, including a career day for women that offered interview training, resume development and professional makeovers. The 2017-18 class plans to create a mentoring program for high school girls, which will cover social media etiquette, resume building and conflict management. “We want to take what we have learned and pass it on to the next generation,” Baker said. An alumnae group formed by program graduates also will provide support for the program and its community service efforts moving forward. The program is a strong community partnership, said Matt Bishop, director of the Fanning Institute.